Acontece no domingo com degustação dos produtos. Vale a pena ir! The plan: Marla's for a pastry, Blue Bottle for a NoLa coffee. Then the cheese monger. Take a number, get 1:1 service. Then bread. Then the date guy outside on the south side. That's the blueprint. 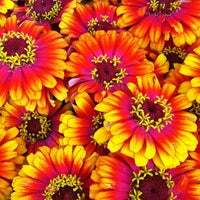 Wonderful market, and great way to start your weekend. Get there early to beat the crowds, the fruit also looks fresh and tastes delicious, keep an eye out for samples! Come with an empty stomach to this nice and big market where you can find a good selection of food, drinks and local products. 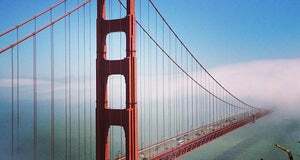 A place you should not miss in San Francisco! 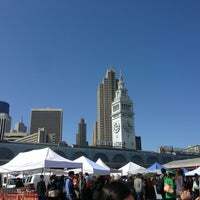 Farmers and food makers from the Bay Area and beyond show off their best produce and specialty items at Saturday's Ferry Plaza Farmers Market in San Francisco. A must on Tues/Thurs/Sats for foodies. 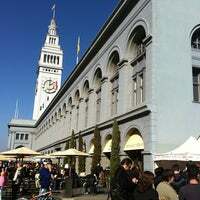 Visit the food trucks, fresh meat and produce stands, or stop into the ferry building for some blue bottle coffee and a waffle, cheese, wine, honey, the works. 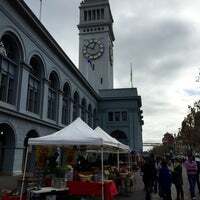 On Saturdays, the Ferry Plaza Farmers Market includes food vendors behind the Ferry Building, offering up a wide variety of cuisines and delicious treats. Wander through the options then enjoy a meal. 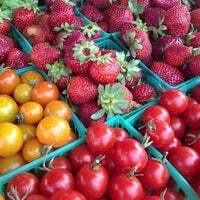 Great farmers market! The lox at Cap'n Mike's Holy Smoke is amazing, and of course we picked up some Blue Bottle Coffee. Lots of samples, too! Cheaper than Whole Foods and lots of different things to try. There aren’t that many produce vendors though. Amazing place! 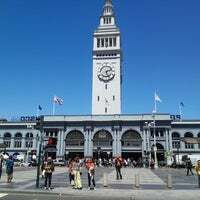 Perfect for brunch and lunch, loads of organic and fresh food options, just by the bay inside a beautiful historic building (Ferry building) in pier 1! Strongly recommended! If visiting SF on a weekend, find me here on Saturday morning for breakfast/brunch. Blue Bottle coffee, Roli Roti porchetta sandwiches, Hog Island oysters, and MORE. + fresh produce. yummm. Come with friends and do a building sampler -get a little something to eat from all of the vendors for your own DIY food tour. Fun for out of town guests! This place reminds me so much of the Danish Torvehallerne - amazing place! Especially if you are into local greens, fruits and a foodie person in general, great stores too! Even though it is touristy, it's also a great food place for locals. 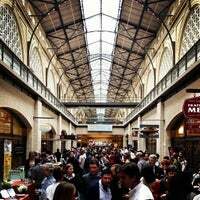 Packed with the greatest SF local food vendors, no better place than here to experience the SF food scene. The pastrami Reuben from Wise Sons Jewish Deli on Thursdays is easily the best Reuben in Northern California. Canter's in LA is the only other place on the West Coast that even compares with it. Walk around once to snack on samples, then again for the food trucks/tents, and then finally to grab coffee and buy fresh food from local merchants and farmers. Everything's great. You can go wrong, unless you didn't get a dozen oysters on your way out. That would be an epic fail. Great selections of veggies and different items that you can’t get everywhere. I find the producers are very informative about their products. Love it. 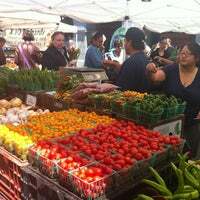 This market is perfect for tourists and locals alike. The fresh produce here is fantastic. The strawberries are phenomenal and the meats are next level. For the love of God and all that is holy, please don't feed the birds, they are getting aggressive! Get your breakfast or lunch from one of the local vendors (Tuesdays and Saturdays) selling sandwiches etc. Then grab a bench and enjoy the view! Elizabeth Yarborough of bangle line Yarbie starts all of her Saturdays here. Check out the color tour of San Francisco she gave us—and score the piece she made just for us!—over at ofakind.com. Best farmers market hands down! Saturday is the best time, they also have tues and thurs as well. make sure to get blue bottles new orleans iced coffee while you stroll. And bring your reusable bags! 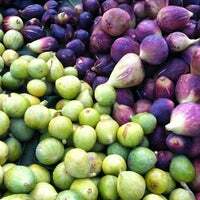 Огромный рынок фермерских продуктов. Отправляйтесь сюда в субботу утром. Не спешите завтракать в здании. За зданием вы сможете купить вкусные свежие блюда из палаток, покушать с видом на Bay Bridge. Early Saturday morning breakfast ritual--delicious food from one of the many food stalls. Primavera, Hayes Street Grill and Hog Island Oysters are my favorites. The Oysters are to die for, melt in your mouth. Get a coffee from Blue Bottle and take in all the wonderful shops. As I walked through, I fell in love. Delicious food everywhere you look. Go find the empanadas! Eat outside and people watch. Latte from Blue Bottle coffee (worth the wait and the line moss fast) and a pancake from Prather's ranch = heaven. Happy Saturday! More vendors that I can count! Pie, produce, jam, bread, meat... something for everyone! Get some strawberries and your drink of choice, then sit outside on the bay side and watch the world go by. 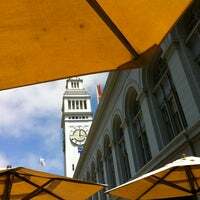 If you are craving Blue Bottle Coffee on those crowded days, head outside to the south side of the market - they have a kiosk outside, as well. 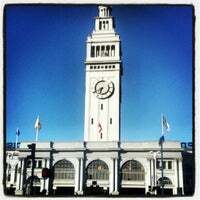 Corazon Under the Dome celebrates the heart and soul of San Francisco! Come discover history, music and culture at our free light spectacular starting at 5pm from now until September 3, 2012! Tuesday, Thursday, Saturday. Great food truck-esque mobile made to order vendors, as well as more traditional produce and packaged goods. There are several vendors of locally produced cheeses here - lots of samples and very reasonable prices! 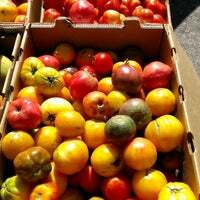 A concentration of some of the Bay Area's best farmers and artisans. A real food lover's delight. Great food stand on tue.thur.and sat. :) fresh fruit, vegetables, and breads, and cheese. Very wide selection. Had the apple cider and it was delicious. Fruit and vegetables looked very fresh. Running the risk of spoiling it for me, the line for Blue Bottle is usually shorter at the outside cart. 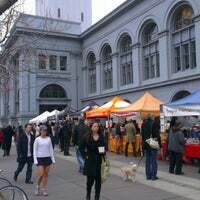 The Ferry Plaza Farmers Market is operated by the CUESA. 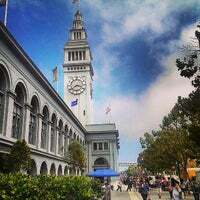 We run three markets per week (Saturday, Tuesday, Thursday) at the Ferry Building in San Francisco. "Vale ficar na fila!!! Uma boutique do cafe!" "i've tried the double cheeseburger, the wisconsin burger, and the texas burger. i enjoyed them all. shakes are great too. plus, ciao bella is nearby for gelato dessert." "Best meal in San Francisco, for sure! É brasileiro? Quer comer bem? Refinado, delicioso e único. Não perca o cellophane noodle, as entradas também são geniais!" "Muito legal experimentar os diversos tipos de azeites e as comidinhas típicas de San Francisco." 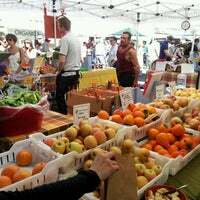 "Cool little farmers market in the Mission District. 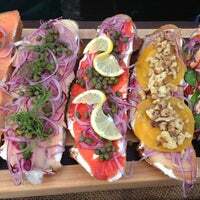 There were several food options, lots of produce, cheeses, and such." "Love their Porchetta rolls. Best I've tried for a while"
"Ideal para passear, conhecer a cidade, fazer compras e ver muitos locais. O pier é bem iluminado, tranquilo e tem muitas atrações no entorno tb. Vale com certeza conhecer." "Ostras deliciosas, bom atendimento, lugar legal para ir com amigos mas chegue cedo."